Isaac Newton, 31, has lived in Atlanta his entire life. 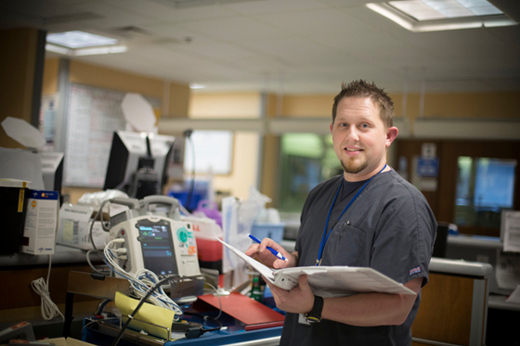 He has worked as an emergency medicine technician and as a hospital tech in a local ER. Married with two young boys, Newton most recently juggled courses, clinical rotations, and leadership roles as an undergraduate nursing student at Emory. In May, Newton and 20 of his classmates made a bit of history as the first graduates to complete the VA Nursing Academic Partnership (VANAP) program. Sixteen of the 21 graduates will soon begin their nursing careers at the Atlanta VA Medical Center (VAMC), where all trained in various aspects of veteran's care, including mental health, traumatic brain injury, home-based health care, women's health, and homeless care. "It was a dream of mine to go to Emory," says Newton, who will begin his residency as a medical ICU nurse at the VAMC this summer. VANAP provided "a unique opportunity to work with veterans specifically," he adds. "All of our clinical rotations, except for pediatrics and maternity, were at the VA. We also had training sessions along the way that meshed with our regular classes at the nursing school." The Nell Hodgson Woodruff School of Nursing and the VAMC launched VANAP in 2013 with $4 million in funding from the U.S. Department of Veterans Affairs. The funding supports additional faculty positions at the School of Nursing and an increase of 100 BSN students over five years. In turn, many of those students will join the VA workforce to help offset a major nursing shortage. The need for qualified nurses is top of mind for leaders at the VAMC, which is part of the largest integrated health system in the United States. "We are one of the largest and fastest growing medical centers in the country," said Atlanta VAMC director Leslie Wiggins during a recognition ceremony for VANAP students a few days before graduation. "We've gone from serving 96,000 to 100,000 veterans in the past 12 months." Wiggins felt right at home with the students. She began her own career as a nursing assistant and served as nurse executive with the Detroit VA Medical Center. "By the way," she added, "I have many nursing jobs that we need to fill." The road leading to those jobs can be challenging, given the rigors of nursing classes and clinical rotations. For VANAP students, the path was made smoother by nursing faculty member Lisa Muirhead, who leads the program in partnership with VAMC. "Dr. Muirhead was my champion throughout the time I was there," says Newton. "If I had a question or was apprehensive about anything, she jumped right in to ensure I had a good experience." An adult nurse practitioner by training, Muirhhead specializes in studying and caring for vulnerable populations, including veterans. In recent years, many have returned from Iraq and Afghanistan with mental and physical conditions that require specialized nursing care. The issues they face affect their families and communities as well. "Our servicemen and women deserve the finest health care system and a highly prepared workforce to support them through their individual struggles," says Muirhead. "More than 75 percent of veterans receive care outside of the VA system. VANAP prepares and inspires our graduates to advance veteran-centered care wherever they practice—in the VA or the community health setting." The students learned from a cadre of Emory nursing faculty and VAMC nurses, many of whom attended the recognition ceremony. Also present was Kate Moore, an Emory faculty member who served with the U.S. Army Nurse Corps in Iraq. During the recognition ceremony, Moore presented students with copies of the book Northwest of Eden. She served with its author, Yancy Caruthers, in Iraq, an experience that changed both of them. "What Yancy and I learned together was the importance of training, mission, and friendship," Moore told the students. "I want to share his book with you so that you can have some taste of what those of us who walked in the valley of the shadow of death experienced." Thanks to Moore and the VANAP faculty team, Newton and his classmates gained a deep understanding of the health services that veterans and their families need. "Working here in the VAMC has only grown my appreciation for the men and women who have dedicated their lives to serving America," said Newton during the VANAP recognition ceremony. "I'm excited for all that lies ahead. I look forward to all of the great things we will do in our careers."